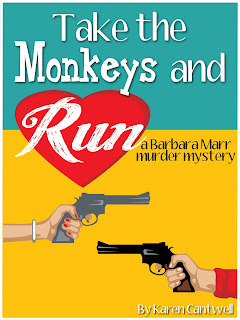 Fiction For Dessert: Take the Monkeys and Run - Still .99 cents on Kindle! 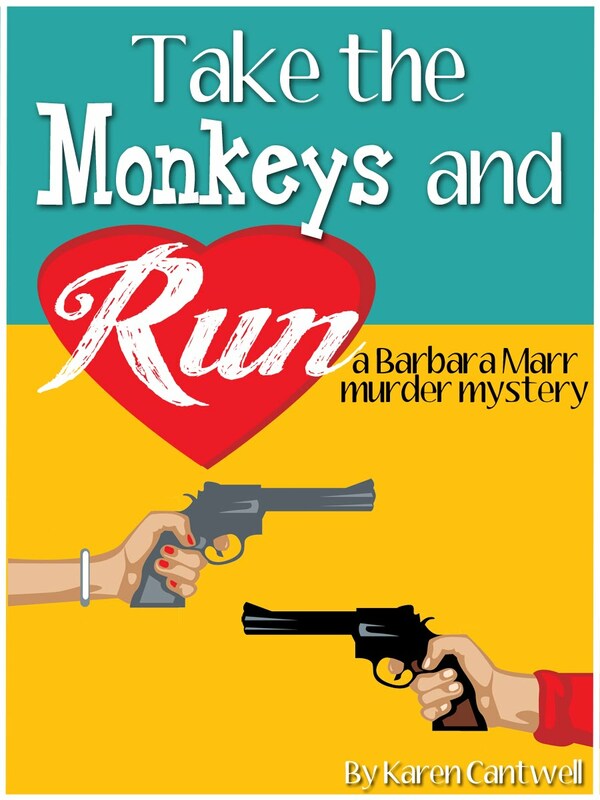 Take the Monkeys and Run - Still .99 cents on Kindle! 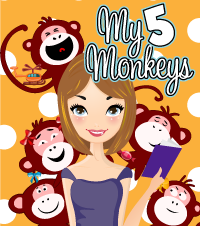 Due to the popularity of the .99 cent price for Take the Monkeys and Run, I have extended the special price until the release of The Chronicles of Marr-nia. 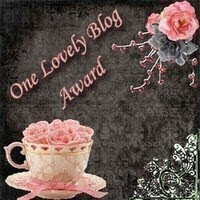 So if you've considered checking it out, now is the time! Click HERE to purchase from Amazon now. The sky was black, my toes were numb and I was a lunatic. Forgetting that our recent October nights had turned colder, I had set out on my mission barefoot. I had no idea what the thermometer said, but the ice cold brick beneath my unprotected feet told me plenty. And my worn-thin-through-the-years knit jammies were certainly no match against the biting air. Evidently I had left my brains in the house along with my shoes and down-filled parka. Indiana Jones, our orange Tabby, followed me and purred while he rubbed against my legs, offering a tinge of warmth at best. Yes, I’m a grown woman and I talk to my cat. What’s the big deal? My cousin Samson the psychiatrist tells the family I’m delusional and should be medicated. Pshaw I say. Samson has a psychiatrist of his own as well as a far more disturbing obsession with large farm animals, so I severely doubt his legitimacy. As long as Indiana Jones talks to me, I’ll keep talking to him. My name is Barbara Marr. I’m not a lady coroner, bounty hunter or crime scene investigator. I don’t fight vampires, werewolves or flesh-eating zombies destined to destroy humanity. Even worse, I don’t knit, sew, bake gourmet goodies for sweet English ladies or refinish houses then flip them for a profit. 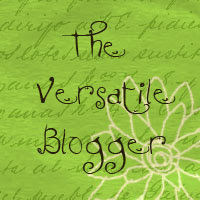 In fact, I lack a veritable encyclopedia of talents and accomplishments. I have managed to give birth to three children, but when my teenage daughter looks at me like I’m an alien from the planet Freak, I wonder at my parenting abilities. Then of course there is my marriage. Not long ago I would have bragged to anyone about our solid bond. True love. True fidelity and commitment. That was before Howard dropped the bomb and moved out. So perpetuating matrimony can be added to the list of things I don’t do. When reviewing the list of lifetime achievements for which I am proud, being mother to my three girls sits at the very top, followed by the time I saw Yul Brenner in a convenience store and discreetly let him know he had ketchup on his chin. He was so thankful that he autographed a bag of Fritos for me. And most recently I got familiar with the video camera again and shot a music video with my daughters. We called it Four White Girls Do Madonna. I posted it on You-Tube and got over twenty-five views. It was very exciting. Still, I’m not exactly setting the world on fire. So when Howard left, I decided it was time to resurrect my dream and write about movies. I love the movies. Old movies, new movies, musicals, dramas, comedies, westerns, action, science-fiction, and anything starring Meryl Streep. Some years ago, in between changing diapers and potty training, I had bought a domain name, ChickAtTheFlix.com, with the intention of building a movie review website. I kept the domain name, but got side-tracked by little things like ear infections, strep throat, pre-school, elementary school and baby number three. Now, with my life deteriorating before my eyes, the time had come to take the bull by the proverbial horns and start anew. At two a.m., I was too tired to think about the website, but too upset about my marriage to sleep, so I turned on the TV. Movie fare included The First Wives Club, A Bill of Divorcement, An Unmarried Woman and The Breakup on HBO. Disgusted, I turned off the TV, turned out the lights and contemplated learning voodoo so I could hex Howard with a festering urinary tract infection. By three a.m., I had been crying for at least twenty minutes when I heard the rumble of a truck outside my bedroom window. Suddenly, I had something else to occupy my frazzled mind. The truck was back at House of Many Bones. And that was how I ended up outside on a cold, fall night with no shoes on.